Don’t worry, that is not my new project. 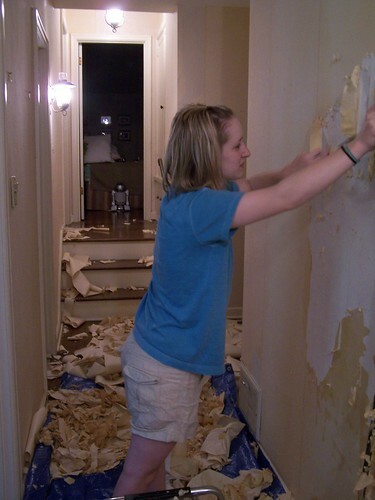 That is one of my daughters stripping wallpaper late one night from another hallway in our old house. Just thought you might be amused after yesterday’s post to see yet another hallway of lovely wallpaper we had to remove. My first official non-furniture project in this house is going to be our stair railing. My girls are very anxious for me to start this new project. They are not a fan of our stairway’s handrail. Neither am I, it just throws a strange curve in our style. I had some stair inspiration photos from a little getaway to The Cannon Beach Hotel a couple of years ago. I decided that I wanted to paint the top of the railing (the handrail) at my new house black like in the photos, as a first step to eventually removing the carpet and painting the whole stairway. Black accents on a white staircase. on the handrail will accept the paint. So far I only have primer. could have had it tinted black to make the final coat easier to cover. I was just using what I already had. I am a messy painter. And since I am a messy painter, I bet that my husband will be the one to actually paint the black. I am not to be trusted with paint (thank goodness, since I don’t love to paint any way). Here you can see a closer view of the handrail. It just isn’t working for our style. but it will be dealt with in another phase. Winston, however, loves the carpet. Why Winston is voting to keep the carpet. How could you let down a face like that? His vote is to keep the carpet because he fell down the red steps at our old house so many times I am surprised he never broke his neck. 15 year old dogs aren’t so sturdy with slippery steps. He likes being able to grip his feet on the carpet as he goes down. For that reason, I don’t have the heart to rip the carpet out just yet. But it is only a matter of time and the carpet will have to go. Why our son wants to keep the carpet. Our son also likes the carpet better than the red steps because a few of years ago he was running UP the red steps and tripped. His mouth went straight into a hardwood step. I have never seen so much blood coming out of a kids’ mouth. Or any mouth, actually. I was horrified! He loosened a couple of baby teeth and cut his gums pretty badly. It scared me to death and I was so worried about his permanent teeth, but he recovered with all of his permanent teeth in tact. He is still a little skittish about wood steps though! I took a few falls myself on those red steps and they really do hurt when you fall on them. Even though carpet helps break the fall, this carpet won’t be staying forever. I’ve already primed a lot of the handrail. You can see, sadly, that my walls are still swine colored. They still aren’t working for me. That is such a big project I am ignoring it for the moment. I might be adding some wainscoting or molding to the walls so I am still deciding how it is all going to come together and what colors to paint. Clearly, this will not be one of those “overnight” makeovers. It will be completed in phases. And, yes, that is a black trash bag over my lamp. Just trying to cut down on the dust while sanding the railing. Once I got the top of the handrail covered in primer, I started thinking that maybe I was fine with it being all WHITE. White would be easier to paint than black and it looked simple and clean that way. But my husband vetoed that idea. He is not an “all white house” kind of guy. So, we will be grounding the railing with black. I do love a black and white staircase and it will give the entry some more pizazz and more “old house” character. As you can see, everyone in my house has an opinion on what our home should be like. And isn’t that how it should be? After all, it isn’t just MY house to decorate. It isn’t all about ME. It is OUR home to live in. We’ve got boys, and girls, and a dog who all live here. And Cheds, the hamster, who always makes a beeline to the stairway whenever he escapes. Last time he escaped I almost stepped on him in the dark on those stairs. I thought he was a sock. I’m sure if we asked him, he’d say he prefers carpet too. Thank you for sharing all this with us to inspire us! It’s great that you kept the inspiration photos from the hotel; they got me thinking… After reading about your son and Winston, I’m wondering if maybe you’ve considered having painted steps and a beautiful stair runner rug that picks out the black of the handrail and whatever colour you decide to paint the treads in this house. That way everyone would be happy. .-= janice | Sharing the Journey´s last blog ..9 Simple Solutions for Procrastinators – and the Scent of Spring… =-. I can’t wait to see your progress on the stairway. Our stairway doesn’t make a statement – it’s hidden and out of view and kind of depressing. Your staircase is going to look awesome!! .-= Lynn from For Love or Funny´s last blog ..Why aren’t these men naked? =-. I love what you are doing! I also love the turquoise lamp….saw one just like it at my favorite store, TJ Maxx…. I love what you are doing with the staircase! I just love the fact that you are making this new home into your style! So inspirating for us! .-= Kim´s last blog ..Half Birthday =-. Informative…yet funny…I love the picture of the dog! .-= shannon´s last blog ..Yellow…I Wait for Springs Arrival =-. You have much that you want to accomplish and I am glad you are sharing it. It is very inspiring that you are considering the needs & desires of your entire family as you work on it. I have been in some homes before that you know it was decorated just for mom’s or just for dad’s taste. It’s not a good feeling to know people don’t feel “at home” in their homes. Looking forward to following this project and the ones you are ready to tackle afterward! .-= Jennifer´s last blog ..That’s My Boy! =-. That wallpaper removal picture is impressive! Or maybe scary, but either way I’m glad I’m not doing it. The black will be a pain to paint but I’m sure the results will be so worth it. Plus, you’ve done the hard part already! .-= Erin´s last blog ..Re-doing the kitchen: Part 2 =-. 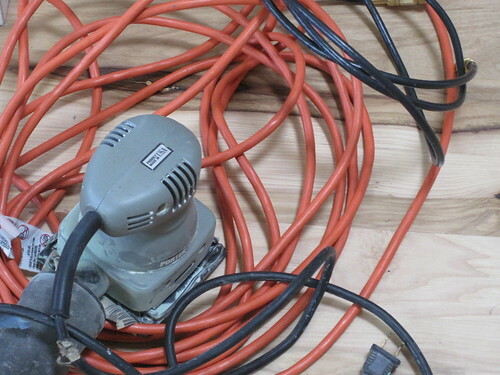 Ok, I’m so tempted to go get the sander out right now and do mine along with you! Here are my befores http://www.onenuttygirl.com/542/painted-stairs/. I have black wrought iron spindles (?) and I was going to paint the handrails black. Do you think it will be too much if I paint the steps black too? Also, curious about the one rail attached to the wall. Did you leave that on when you painted? I was thinking of taking mine off. And yes, ugh on the primer! I guess you reminded me I had to do that too! LOVE IT…Sending you project completing vibes! .-= Mary Jean´s last blog ..Food Inc, The Movie =-. I think it would look great to have black steps and railings! Go for it! No, I didn’t take that railing off. We will have to, probably, when we go to paint the walls or add wood trim. But since I was just priming and I didn’t care about the walls I just left it on. I might even take it off totally, I don’t think we really need it since there is a railing on the other side? Can’t wait to see your stair project! Glad we can cheer each other on in! Love it. The best thing to do on any space is make it a space everyone can love. I had wood stairs at my last house and loved them but took a nasty spill in slippers one day. OUCH! .-= Emily@remodelingthislife´s last blog ..Gussy Winner =-. Love the black and white staircase look. But “ouch”….I too fell hard on my sister’s wooden stairs as my stocking foot slipped out from under me. Lesson….do not go down the stairs in slippery socks. I also like the look in the hotel with the gorgeous carpet runner they used. I unfortunately am a practical “safety first” kind of gal. Good luck with the black paint! That is looking great! As much as I love painted stairs, ours are carpeted as well. I hate how grungy they can get. BUT with 4 kids 9 and under, carpet is the only way to go for us right now. The thought of them falling without the carpeting horrifies me! 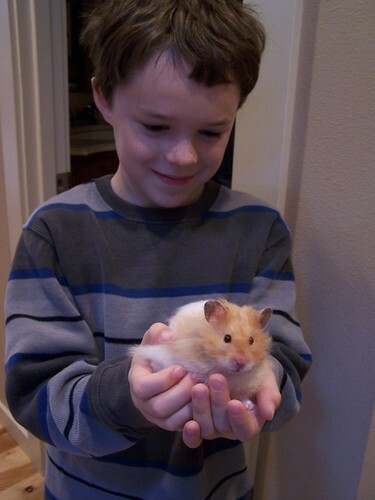 On another note, that is one cute hampster. The one I had as a child would always escape and head for the laundry room door. Eventually he gnawed off the entire bottom edge! I LOVE the black railing pictures. Can’t wait to see how your transformation turns out! That is a big project but it will make a striking difference. My husband does not paint! He does lots of other things that I cannot do, though. .-= Becky K.´s last blog ..Unexpected Blessing =-. .-= Jess @ Frugal with a Flourish´s last blog ..Bargain Alert: Hobby Lobby =-. Those photos really got the “juices” flowing…what a REMARKA BLE change you can do…is there still a question about beige and color??? I am pretty sure I will be still going with neutral walls in that main area of the house. Just not with pink undertones! I have a few sample splotches on the wall, still trying to pick the right one! I love yellowish walls but with all the color I have in my stained glass and some other pieces I am still debating what neutral shade would look best to let my colored pieces take center stage! But for sure I am going to use color in the powder room and probably some bedrooms and the laundry room. Color just makes me happy! Melissa, thank you so much for visiting my blog yesterday to see our new bathroom. I respect your opinion so much and was delighted with your comments. Your stair railing is going to be fabulous! .-= Bonnie Mattson´s last blog ..The New Bathroom At Last Revealed! =-. Those steps are going to be gorgeous! I have that same “orangey” wood on my stairs in my house too. I want to stain them a dark color, but my husband isn’t up to the task just yet. It’s so messy! I can’t wait to see your transformation as it unfolds. Thanks for sharing the beautiful inspiration pics! .-= Traci Hutcherson´s last blog ..Wednesdays with Wanda =-. I applaud your project! The black and white will look stunning! I second the vote about the runner – it is a great way to have both wood and some cushy-ness :) I’m not sure of the proper term for it, but I call them runner bars. Have you ever seen them? 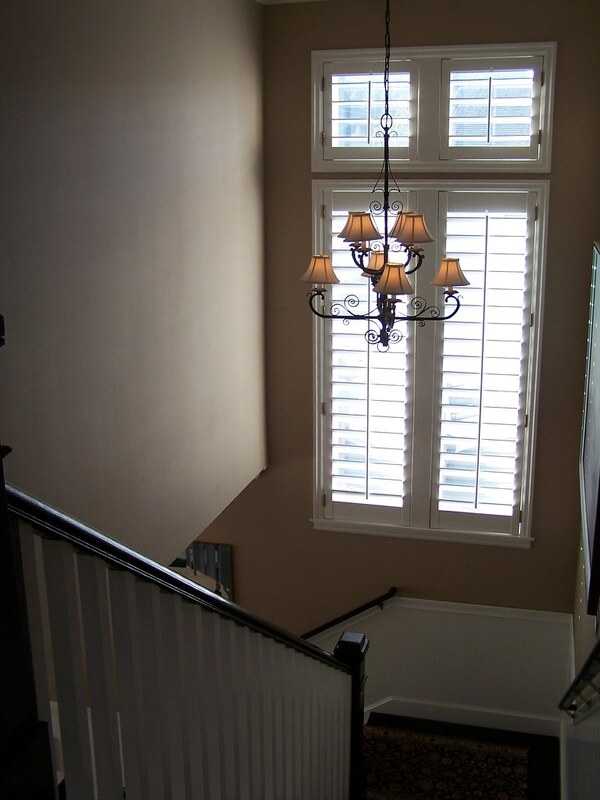 They are not only a great decorative touch but also help keep the runner nice and snug in the elbow of each stair. Good luck and look forward to seeing your progress. Yes, I’ve seen those. We had a runner down one set of stairs at our old house but they didn’t have the bars. We were forever re-stapling the carpet. Carpet runners might be the best solution for the best of both worlds. I am hesitating a little about the runner because of the extra steps in cleaning (you have to vacuum down the middle and wipe the wood down the sides)–but I do love striped rug runners so I am tempted to consider it! And it would be softer for those clumsy people like me, kids and dogs. That’s the biggest, fluffiest hamster I’ve ever seen in my life! And I think the black handrail will make a huge difference! .-= Sarah@Clover Lane´s last blog ..How I Transitioned Our Family To Healthier Foods =-. I can see it now…It is going to be beautiful! :) I love anything black and white…:) Your husband is somewhat right…You can tint the primer…But they can’t get it black…only grey…But even that makes it easier…I am excited to see the project complete! Yay! Although we have beautiful hardwood floors throughout our home, we actually installed a stair runner so our portly pug could manage the climb up and down safely. These are definitely the things that make a home “us”. 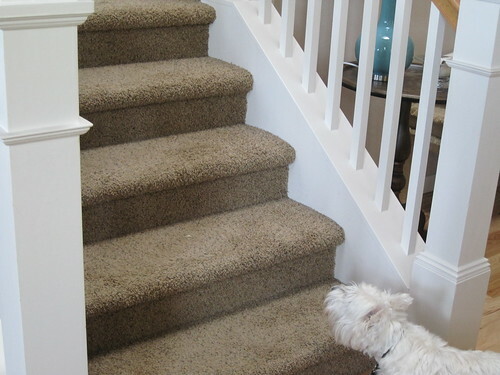 Ha, yeah, I am thinking that a runner might be just enough to help the dog go up and down the stairs safely! .-= kathysue´s last blog ..What Is Your Design Spring Board? =-. I’ve enjoyed looking through your blog. Love your style. And love how everyone in the house gets a vote toward how the final house comes together. You’re right; it IS all about making the home US, not just ME! Good thoughts to start my morning : )! Love the staircase ideas-I have wanted to paint mine so bad but we live in a 110 year old house and none of the woodwork has been painted. I would go ahead and paint it now but we are going to downsize and sale it-this is very hard for me too-struggling with it alot. Oh well anyway-thanks for all the pictures and great ideas-may use them in my other house. .-= Lizabeth´s last blog ..I Gave in to Ravelry =-. I love these kinds of projects! Well, anything really that makes my home into our style…it takes time but we are at home in our home now! .-= Mrs.Rabe´s last blog ..Sisters and Daughters =-. I’ve gently tried over the years to convince the fam to let me tear out the back stairs carpet- just the back stairs, not the front!!! Although I’d love it…. I’m feeling stronger in my bid, though now it’s complicated by grandbabies learning to climb…. 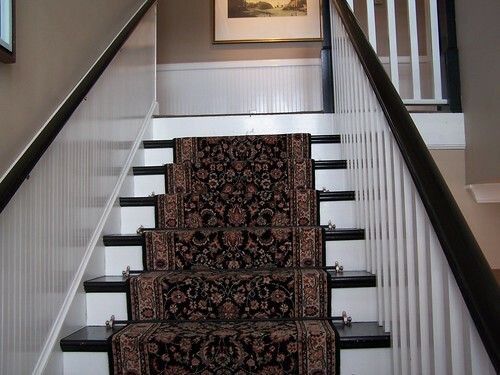 I’m fine with a stair runner but I see pictures with and without the bars keeping the carpet in place. How are they NOT using the bars- glue? I need to know cause last night I saw bars for 2.99 at Tuesday Morning! Thanks! .-= Lisa´s last blog ..2009 =-. There are some special carpet tacks that you can use to tack down a runner. We had a runner on our main staircase in our old house and that is how it was secured. We did have to put in new tacks from time to time though because they tended to pop out! The bars can be very pretty and probably would keep the carpet a little more tight and secure, but I have never had them so I can’t tell you from personal experience. I am really feeling this black rail idea. We have a vacation home that has oak everywhere and I am not a fan. My husband gets that but there is too much to start painting everything and white just wouldn’t look rustic enough. I am thinking, though, that I could pop some areas with black. Thanks for the inspiration. .-= pam rosenberg´s last blog ..The Many Looks of This Old House – The Living Room =-. Looks great. I definitely like the all white a lot better. I think once Spring comes around, I am going to start a few paint projects myself. Wow! That DIY Jessica did is really stunning. Makes me wish I had a set of stairs to remake! .-= Lesley @ TheDesignFile´s last blog ..DIY: Bookcase makeovers to swoon over =-. I immediately spied that lamp in your photos. I just bought that same lamp in apple green yesterday at Homegoods! I love it. Yes, that is where I got mine! :-) Love their lamps! The white already makes it look better, and the black handrail will will be even BETTER! Great pictures! Maybe the carpet will look just fine for a while with the black railing. Sometimes the little changes make a big statement too! .-= Heidi´s last blog ..Lucky to be with You! =-. Holly, it really wasn’t that bad. Once I set my mind to it and just dove in! I am sure the black part will be a pain, trying to keep it from running into the white and painting crisp lines will be hard…but the primer and plain white is not hard at all. I got a tiny brush out for the finer details and just sat on the steps and painted away. I was so happy when I came out of my bedroom today and looked down stairs! More more orangey oak. Feels SO SO much better, even with just primer! .-= Natalie´s last blog ..Underfoot =-. I love this post. It is so real! Family is everything in a home, and my boys definitely let me know what is a “go” or “no go” in our house too. Can’t wait to see the finished pictures, because this is something I have thought about since moving in, only I had wanted to paint the spindles black. I think just sticking to painting the railings will be fantasic. Now hurry up and finish! .-= Misti of Studio M Designs´s last blog ..Ballard Designs Love =-. You are a brave woman….stairs are a pain to do…and all that cutting in. Looking good. Looking forward to seeing how it turns out. .-= teresa´s last blog ..Green Explosion- =-. Wallpaper is the worst. Even if it comes back into style in a crazy way, I’ll never use it just for sake of the future homeowners. We’ve remodeled too many houses with awful wallpaper. 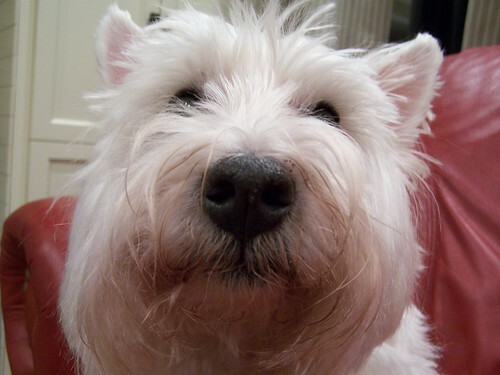 I, too, had three Westies (sadly only one remains – he’s 13 1/2) and they, too, were constantly falling down our stairs after we removed the carpeting. They could empathize! .-= Judy@cutest-little-things´s last blog ..Just when we thought the snow was over =-. I painted our handrails black a couple of years ago and couldn’t believe the difference. It added a real punch to a rather blah staircase. Yours will look gorgeous! We recently found out that we’re moving, too – and we’ve found a house with great “bones” but horrible decorating – emerald green carpet throughout, dark terracotta kitchen, dark tuscan gold hallway, etc. Lots of work to be done, little by little. I don’t comment often but I read every post. .-= Lorrie´s last blog ..Artistry on Ice =-. Never ceases to amaze me what a difference a little paint can make! .-= Lei´s last blog ..Think Spring =-. Great transformation in the works… love to see these projects in action! A thought about the painted steps… do they make a textured paint, or a sanded paint, and would that take the edge of the slipperiness? This is great, i can’t wait to see how the transformation turns out!! .-= Stephaine @ Geezees´s last blog ..Today is my SITS day with a few of my Best of’s … =-. I’m glad I’m not the only mama whose little one has lost a baby tooth to the hard wood stairs. Our 2 yr old has quite the quirky smile (bottom tooth, thank goodness) from slipping on the stairs in a new pair of footie pj’s. I’m slightly neurotic about the stairs now. I spent most of today working on our entryway. Tore up the majority of six layers of linoleum and chipboard installed over 200 yr old plank floors. .-= Hannah´s last blog .. =-. Your stairs are going to be beautiful. I just might be a black stairs convert. Thanks for posting these pics! I just love this project! I am so excited for you! The process of making a house more into your own family’s special place is a lot of work but so worth it as you know. I am having a ball with my own right now and the furniture just arrived! I am SOOO excited! I would love for you to stop by and see it in my latest article. I would love your opinion. We have a long way to go but this first step has had such a huge affect on me. I know that environment has a strong affect on people, but hadn’t realized how much mine had started affecting me until this morning when I woke up and began my day with my new beginning…Wow! What a difference! Can’t wait to see more as your stairs and “swine” walls become more yours! Thank you so much for sharing it! .-= Mary Joy´s last blog ..The new furniture has arrived…a new beginning has begun!! =-. 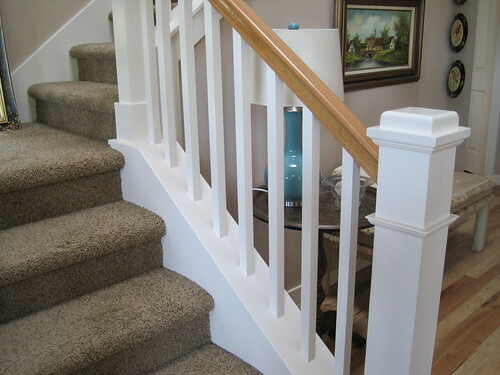 Those stair railings will look gorgeous after you’ve painted them black! I honestly don’t see what’s swine colored about your walls although I do know that colors sometimes don’t photograph accurately. .-= Astrid´s last blog ..Ava’s Fourth Birthday Party ::Part Deux =-. Wow! It’s so nice when a house starts to feel like HOME!! I love the idea of the black railings, that’ll be beautiful! Can’t wait to see more! Melissa, that is going to be beautiful! 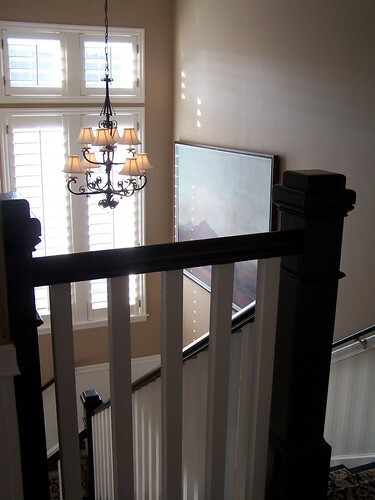 I have loved the trend of black painted railings and stairs, gorgeous and classic. Keep going, you’ll get there. I hear you on the carpet too. I have a set of carpeted stairs I’d love to get rid of too. Melissa, it is already looking amazing…I can just imagine how incredible it will look once finished. Those stairs from the hotel are beautiful, no wonder you were inspired. Good luck! Meredith xo. .-= Meredith´s last blog ..rainbow cake =-. You might consider a Dash & Albert striped runner (from designer Annie Selke) for a more contemporary look that wouldn’t be as “carpeted” as what is currently in place. That would provide more secure footing for all, as well as some interesting colors that you could pick up in paint or artwork. Also, black steps (or flooring) show every speck of lint or dust, so while you’re concerned about having to clean two things on the steps, you would probably have to clean less often with a runner. Happy decorating! Thanks Jan! Yes, a Dash & Albert striped runner is actually at the top of my list for that stairway! I have two D&A rugs in my house already and I love them. love your dog hes adorable, im a petsitter and see lots of animals year round. wheres the after picture? Oh my, I just finished my own project. Thankfully it only involved some KILZ and paint… and no wallpaper stripping. That’s my most hated job. Your new staircase is going to be FAB! .-= Christi at Charm & Grace´s last blog ..A(n art) Room of One’s Own… =-.